Hello again my fellow questioners, this week is probably going to lack my typical feel because this merits a more serious and somber tone. 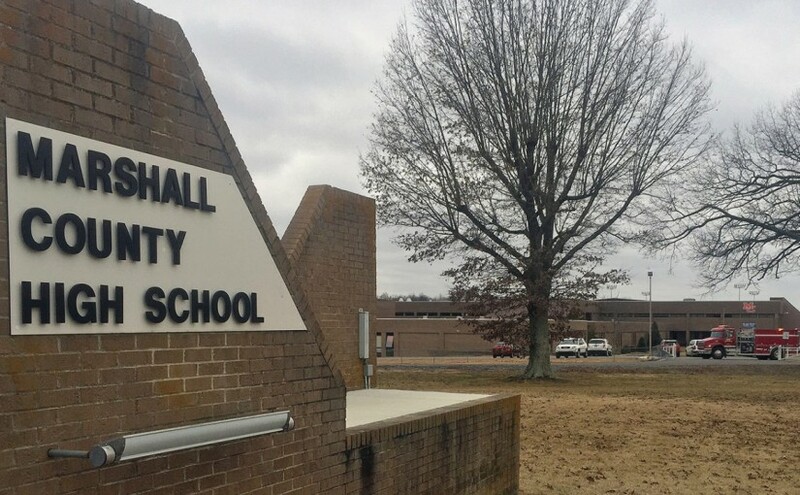 If you have paid attention to news articles at all in the past few weeks then you’ve likely heard of what happened in Benton, Kentucky – specifically at the Marshall County High School. I gave it this much time before speaking of it for three reasons. First, I refuse to try to capitalize on the deaths of innocents. Second, I needed to wait for more information to come in. Finally, now this is on full disclosure, I’ve lived in the Benton area before. While I never went to the high school some of those connected to this horrifying event are either acquaintances or family. This is even more harrowing for me knowing my own history in dealing with close to home tragedies. Now before going into the meat and potatoes of this I have to make this known, through the people I still talk to in Marshall County and all that, I do know the name of the assailant as does everyone connected to who is involved. However, due to the nature of not knowing whether or not the 15 year old boy is going to be charged as an adult like Michael Carneal was, yet I am not going to release his name. If this changes I will add the name to an update on this article for the sake of accuracy. That being said, chances are soon enough its likely going to be public knowledge regardless of the wishes of those who want the name kept private. Here I will go into some of the pathology that led to this terrifying event. I intend to do this to not only help prevent more of these in the future but also to show that this is ultimately a result of the zero tolerance policies we were talking about earlier being an absolute failure in both concept and execution. With that in mind Let’s Hammer This In! First let’s set the stage by describing the community we are talking about here. Like I’ve said before I used to live in this county, not just for a couple of years as an adult but on and off during visitations with my father for a decade of my life. It was through this interaction that I got to see the darkest side of this community. They are a bit reclusive at times like many small communities and also a bit full of themselves. This is not to say that the community there today is as such but I wouldn’t be surprised if repression was somehow connected to this event. Another thing that we had to deal with concerning this county was effectively remnants of the Klu Klux Klan. Later on this group’s hold on the leadership has all but disappeared but the scars that leaves are visible to those who know what to look for: Namely the amount of literal Neo-Nazis that do exist there. I’m not talking your run of the mill Alt-Right edgelord type who thinks they are being a cute little ethno-nationalist. I’m talking a full blown, Hitler-heilingn skin-headed SS wanna be. People who actually sport the regalia of the Third Reich hoping for a fourth. Granted I’ve only met two or three in my entire lifetime there but it was enough to learn that they were organized enough at the time. I mention this not to turn you against the honest good people that do live there but as a way to show that even the most peaceful and benign people have their skeletons to clear out, also as a lesson that needs to be taught to more people. Don’t judge the members of a community by the exceptions among them..
Now when it comes to what we know about the shooter that I can reveal, there are a few things. To begin, all his social media accounts were deactivated soon after the event. In these accounts he had referenced not only The Rifleman’s Creed of the Marine Corps but quotes of Joseph Stalin. At the same time family members rushed to defend his indefensible actions, mentioning how he was simply a kid who was hurting. It has also been revealed to me that he came from a broken home, also that his father had died recently. Some claim the father was abusive as well but I am not as confident about that claim due to how fathers are treated in many of these situations in communities like those in Marshall County. Also he used a handgun to perform this tragedy. No one mentioning the make and caliber of the gun, either because they are too young to know the details (from the bulk of those who do have gun experience among them being taught on hunting rifles as opposed to pistols) or they are too traumatized to reveal the information. There was information put out that he had an interest in mafia style violence but that he didn’t seem to them to have any personal problems. Its likely he had already been repressing his emotions and with a distinct lack of male role models he searched for them in ignoble examples. Another bit of interest is whats going to happen to the firearm in question. Due to a 20 year old Kentucky law the piece in question will eventually be auctioned off in a confiscated arms sale. It is a magazine clip fed pistol to boot. Chances are he had inherited the weapon from his father somehow as well. Another aspect of this is something we have been talking about all month – bullying. He was bullied on a regular basis, which is why even some of those who are victims of him didn’t blame him. This is where I think the conversation about shootings and perhaps even the issues of young boys can start to take a more open stage if we push for it to. I don’t think the mainstream will let us do so though. These students, despite everything, are showing compassion for their assailant, not from some bizarre sense of Stockholm syndrome but because they all knew what he was going through. What his mother ignored, what the world would love to keep ignored. That this young man was himself a victim, that he was vulnerable and that’s what led to this tragedy. This shooting had nothing to do with any form of media, it had nothing to do with any sort of ideology even if hints of such are there. It all came from a lack of a positive male role model that could have helped him cope with his feelings and hardships, even helping him with his bullying situation. Also I found in my research on this whole situation with school shootings, the exponential increase of these occurrences seem to go hand in hand with the Zero Tolerance Policy I’ve mentioned before. Its almost like if you don’t give a person the ability to defend themselves or you side with the bullies then they start feeling that the extreme circumstances they are subjected to require extreme measures to correct, even if the measure they take end up being the worst mistake to make. One thing that did help me a bit through school when I couldn’t discuss things with either my father or my step father is the fact that one of the two guidance counselors at my school was a man I was able to trust and speak plainly with… one who didn’t mind if people swore and would likely drop the F-bombs with you. He was a wonderful teacher and back-up coach for the school. Also his daughter who was in my class ended up becoming one of the more balanced graduates my school produced due to his direct influence in her life. In fact, when someone attempted a shooting at this school back during my freshman year there, he had helped diffuse the situation before a single shot could be fired. This will seem crazy to those who wish to completely deconstruct our society in favor of their own insane ‘utopian’ visions but it seems like the solution to school shootings could be strong and positive male mentors in the forms of teachers, counselors, and fatherly involvement. Imagine that. This may seem shorter than it should but the event in question was surprisingly short- lived as well, much like many of these shootings are. I think a lot of people out there are of the mind that these tragedies occur in a matter of hours when in reality they mostly are finished within minutes. Part of why this is stems from the fact that police are typically given a patrol around schools for child safety so they can respond even before the call goes out if the gun shots are within their earshot. In these cases someone can be on scene assessing the situation while more officers come on to the scene, and they can start plotting to diffuse the situation, hopefully peacefully disabling he assailant. But often its still not quick enough. That’s why the conversation about diffusing it before a gun is even lifted is so necessary. Trying to remove the weapons won’t stop a thing. They’ll just find another way. I will appreciate all the input any of you can put forth on this front. Next week I’ll try to prepare something a little more cheerful to go over. Until then Please Remember to Game Freely.